I, perhaps like many of you, received a mailing from Life Line Screening, which when read may seem like a smart preventive healthier living strategy. Who would not you want to know if they are at risk for a stroke, aneurysm or other life threatening vascular disease? They outline however that they only do the testing and if any of your test results are abnormal, you will need to see your own personal physician. The results are provided in the format of "normal", mild risk, moderate risk, significant risk or normal/abnormal. None of the test they offer are insurance covered but the seemingly low cost of the screenings and the ease of receiving your online results makes it seem like a bargain. So, is this really something worth you investing your money in and if not why? Testing not collaborated between you and your primary care physician is not wise. If your Life Line Screening has any abnormal result, your primary care physician will need to evaluate your personal risk factors and if warranted order testing that will be covered by your insurance company. Mass screenings done by private entities can do more harm than good. To get a more en-depth perspective read "Don't Reach for Life Script Screenings". 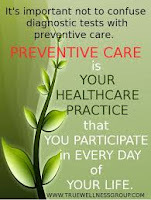 Preventive health focuses on taking measure to prevent disease as opposed to treating disease. Routine screenings based on risk factors, family history, and age are a facet of preventive health. However, more importantly, it is vital to establish a working relationship with a medical professional (primary care physician, nurse practitioner or physician assistant) who can help evaluate, coordinate and monitor your healthcare. Striving to make healthier food choices, reduction of stress, smoking cessation, adequate sleep and exercise can help reduce your risk of disease. Together you and your practitioner can outline your wellness objectives and seek to achieve them over your lifetime.